TLHing some HYC shares shortly and have been advised here not to invest back in after the wash sale period ends, due essentially to the fact that the credit losses offset the higher yields of HY. Wanting to see evidence of this, I have looked through the financial statements for HYC and find that over the last ten years, including the dark days of the economic crisis, average annual return has been 7.04% for Admiral shares, made up of 6.74% of income return and 0.30% of capital return. Clearly in 2008 there was a large capital loss essentially offset by capital gains the following year. But on average over these ten years capital return had almost no impact on total return. Now, if HY was taking regular capital losses from having to deal with defaulting or soon to default bonds then would this not show up in the capital return and eat into the income return? Since it does not show up in the financial statements, I am a bit of a loss on giving credence to these losses offsetting the higher yields and can find no real reason to not re-up after the wash sale period. Re: Where do the losses in HY show up? Good question. Analyzing the 15-year's of returns (2003-2017 inclusive) broken out by capital return and income return provided by Vanguard here, https://investor.vanguard.com/mutual-fu ... ve-returns, the cumulative 15-year capital return is 1.2% (0.1% annualized), and 15-year cumulative income return is 183.7% (7.2% annualized). So not negative, but slightly positive capital return. One thought is that perhaps the return was lower than expected based on the initial yield. SEC yield on 12/31/2002 was 8.37%. So 15-year annualized return was a bit more than 1 percentage point lower than the initial yield, which is within the typical range of initial yield prediction error. However, most bond funds probably had 15-year returns that were higher than the initial yield--at least that's my guess based on looking at 10-year returns and initial SEC yields for several bond funds in previous analyses (maybe I'll check this). Regardless, the common wisdom is that the expected return would be higher by using a safer bond fund and increasing the equity allocation a bit, since the correlation between high-yield corporate and stocks is much higher than that between safer bond funds and stocks. This would be especially true in a taxable account, because stock returns are much more tax efficient than high-yield corporate bond returns. Nevertheless, I've continued to hold a relatively small position of high-yield corporate in an IRA for some years. What "evidence" would make you "give credence" to "offsetting" (whatever that is)? It's a good question, let's not cast aspersions on the question. Kevin M points out the relevant evidentiary standard: capital return over a period of time including credit events. I would postulate that Total Return was high (and capital return less negative that expected) primarily due to very aggressive corporate balance sheet improvement (and corporate valuation increase) over the last decade. Isn't this what most would expect? I have a small HYC position and I expect it to perform along a similar trendline as my equity positions (in corresponding markets) with some moderate affects from interest rates. It is very risky but presents fairly high returns. I can't imagine VBTLX losing 20% in a year. Ever. It is 65% government debt. I hold a small HYC position, but I would echo Kevin M's last sentiment. I certainly focus mainly on the equity side for growth (and this has beaten my HYC position for the last 10 years). I think taking risk in bonds is a little silly. I just do it for a slight bit more diversification. If you are going to take risk, get the higher returns in equity. It's in the thread title, and was clear to me from the OP. I'll state the question as, "Where do the losses, that we'd expect from the higher default rates of lower-rated bonds, show up in the fund returns?" I've seen posts where a price chart is shown to demonstrate that there is gradual NAV decline, with the implication that this is due to defaults of some of the lower-rated bonds that a high-yield bond fund holds, the contention being that this offsets the higher yield, at least to some degree. This is not apparent in the capital returns for the 15-year period I examined. Looking at a price chart at Yahoo for this period, I also don't see it. I did the same analysis on VBMFX (total bond index). The initial yield was 4.16%, and the annualized 15-year return was 4.0%, with 3.6% from income return and 0.4% from capital return. 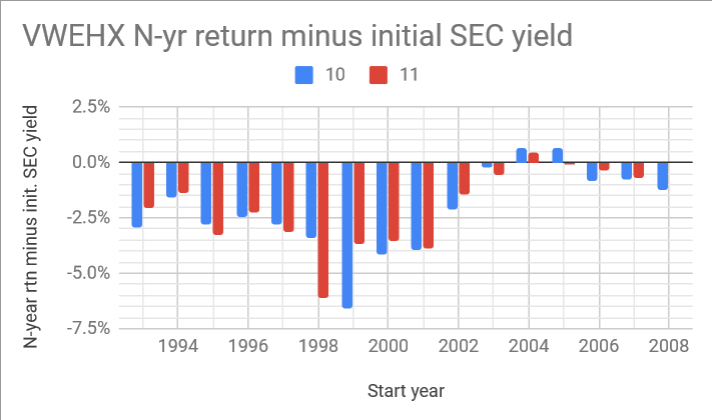 This is only one data point, but we do see that the 15-year annualized return was very close to the initial yield (but not higher, as I guessed it would be). I think taking risk in bonds is a little silly. Is it? So the trillions of dollars invested in non-government bonds represents a complete failure of efficient markets (and critical thinking) by thousands of people? Doesn't that seem...unlikely? Or at least something that requires a comprehensive explanation. "Extraordinary claims require extraordinary proof". High-yield bonds make up $1.21 trillion of debt. What's the explanation for a market failure of that magnitude? I find the OP incomprehensible. .... Wanting to see evidence of this ...... that the credit losses offset the higher yields of HY. There isn't much evidence of this over the span of the last 10-15 years in Vanguard's High Yield bond fund, but capital losses due to defaults do happen in the high yield bond arena. Defaults are low during the good times, and higher during times of distress. Some of us believe that the market fully understands the possibility of defaults and the higher interest rate more than makes up for any capital losses. VWEHX, the High Yield fund started on 12/27/1978 with a NAV of $10.00. Today the NAV is $5.58. Over the past 40 years the capital loss is about 1.01%/annum. The return over that time period is 8.32% per annum after accounting for the capital losses. I expect to remain a holder for a very long time. I think it is silly, because I like to go all out on the risk spectrum. I don't understand going halfway by tilting heavily to HY bonds instead of equities, but this is just my opinion. I don't understand what you mean by market failure? Different investors will always prefer investments with different characteristics. They all have different personal preferences/biases, goals, tax situations, time horizons, etc. I think High Dividend Yield Equities are pretty silly too, but the Vanguard fund alone has $30 billion in it. This isn't a failure, it is simple free market investor preference. Actually the fact that the junk bond market is a small fraction of the $30 trillion dollar US debt market might be construed as evidence that many folks think exactly as I do. I don't understand what you mean by market failure? Different investors will always prefer investments with different characteristics. But the usual Bogleheads argument about high-yield is that they are mathematically identical to having a bit more equity. There is no "preference" involved. It is presented as a mathematical fact and every single investor should prefer that tradeoff, especially once you take the lower taxes & transaction costs of equities into account. It is never discussed in terms of pros & cons. That's why I mean by "where's the explanation" for over $1 trillion being invested in something that Bogleheads & academic research says has no actual benefit, has no market reward for the risk taken, and is trivially replaced by something with lower costs? It isn't like we're saying "oh to replace it you need to use fancy derivatives and hire a full time manager and..." We're literally saying "take 30% of it and buy the S&P 500 and put the rest in 10-year Treasuries". Those are the two simplest and most liquid assets on the planet. Predicting the future can never be a certainty, hence my use of the word "preference". Preferences can turn out to be poor financial decisions or good ones, only time will tell. Over the last 16 years (can't go further back on PV), SP500 has outperformed VG HY Bond by rough 1% on annualized basis. This helps support my reasoning for suggesting that I prefer to slide the risk scale further out and just dump most of my "risky" portfolio into equities, but past performance is not necessarily a predictor. I still own a small amount of HYC because Total Bond does not include (and I value diversification). To me, focusing on Junk Bonds is like saying, "I want to be pretty risky (albeit maybe slightly less risky that equities) but I also want to reduce my potential returns". Don't forget that in high yield, you have non-trivial slippage from defaults, so you're really getting less than the yield implies. In some way you can think of part of the yield as a "return of capital" component. This is a typical sentiment I see on the board, so I am looking to find evidence that it is true. I could not find that evidence in the 10-year returns of HYC, which showed a slight positive capital return. So I am asking for a link that demonstrates these defaults (or sales based on expected defaults). Why does this matter. Grabiner in a separate post advised after TLH to re-invest instead in munis, as the tax situation works out better. This advice is premised on the fact that HYC experiences average default-related losses of 1.5% annually, per a Rick Ferri post. In looking at the NAV for HYC, 0n 7/1/2008, it was 5.55. On 6/30/2018, ten years later, it was 5.70. If losses from default sales on these funds were regular and one did have to account for them in reducing return expectations, one would think they would have showed up during this 10-year window. Obviously there are cap gains from falling interest rates, right? What am I missing? I think over this period capital gains from falling rates were likely higher than default losses. Dale Gs post above shows that the average capital loss over its lifetime is ~1%. Yield - 1-2% is probably a good estimate of return for the vanguard fund specifically. What you are discussing is what I want to find evidence of but have not found it in the financial statements I seen so far. Can you direct me to reports that show a historical record of those default losses? ^ Where exactly did you look? I was a long time owner of Vanguard's HY Corporate bond fund. Its long term performance was excellent. I finally sold it to simplify my AA. Some have argued that one should take their risk in equity and leave bonds for safety. That is a sound argument and I can buy into it now, but if not for my simplification quest, I would still be comfortable with this fund. There is a lot of variance in the risks that HY bond funds take. The Vanguard fund is much more conservative than many other HY bond funds which suited my risk tolerance. Even so, it can sustain major losses in a bad year. However, I think it is an excellent fund for those interested in HY bonds. Run the numbers over 1990-91 . Something like 20% of all HY issues were "distressed" at that point (the arrest of Michael Milliken and the bankruptcy of Drexel Burnham Lambert coincided with the implosion of that market and ended the first, great, era of the Junk Bond). I used to get my stats from Edward Altman's website at NYU (he invented the "Z Score" measure of corporate financial distress). However he may no longer be publishing (or alive?). If you run from the beginning of the fund, you see a steady loss in NAV. And remember the Vanguard fund is less "junky" than the index or the average HY fund. It won't have much of a default rate (probably they disclose that number somewhere in the product literature?). The regressions show you don't gain much on a risk adjusted return basis. Couple of outliers: Bill Bernstein's piece on when to buy HY bonds (that worked very well in early 1990) and also what Anti Illmanen has to say (I don't have the book Expected Returns to hand, but it's the go to for all "anomaly" type investing). Credit is a separate factor than term risk. It might (or might not) be a separate factor from equity risk. But those 2 factors are quite closely correlated. Other problem is tax inefficiency for a tax paying investor. OP has been told that defaults occur and cause capital losses. OP doubts that this is actually true, and wants to see evidence that this phenomenon really exists at all. Atlman's site is down (or blocked to Europeans) - it appears that he did die. The above gives you the defaults by credit rating over time. Why then would the NAV fall from $10.00 per unit to $5.88? If not by defaults, do we believe that there is a bond fund out there which, due to interest rate/ price movements, the bonds are worth 40% less than they were when the fund was launched? Maybe some EM bond fund - although EM bonds have been on the tear of all time from 2008 until Turkey had its whoops moment (January?) excepting the "Taper Tantrum" (2012?). So they'd all be trading at big premia to par value, too. ^ I think it's even simpler than that. "Defaults occur and cause capital losses" is a simple statement of fact about investing reality. Also keep in mind that a bond doesn’t have to default to generate a capital loss. Since the Vanguard fund holds higher rated junk, a bond that drops in credit quality make take a loss and be sold by the fund because it no longer meets its credit quality requirements. It seems in the last 10 years that there have been relatively few capital losses or defaults, most likely a result of a growing economy and lack of recession and that these have been more than offset by capital gains resulting from falling interest rates over that same period. Valuethinker, thanks for the link to that presentation, it will take me quite awhile to get through it. On your first point, there has been a loss of NAV but as far as I can tell, this happened much earlier in the fund's history (it has been around since 1978). I have owned if for a very long time but my records only go back 15 years or so. At that time, the NAV was 5.73, basically where it is now. So no, I do not see that steady loss in NAV. It would appear that the loss from 10.00 to its current levels happened in earlier years but not in total over the last 15 years, if NAV is a good approximation of those losses. One of the points I am trying to establish is whether one's return expectations need to include a decrement for capital loss, as often claimed here. On your second point, that they disclose the number somewhere in the product literature, is what I am trying to find and have not been successful so far. HYB behave somewhat like a quality bond/equity mix, more volatile than other bonds but with higher yields and higher expected long term returns. If you wish to include them as part your portfolio you might want to adjust your bond allocation a bit higher and your equity a bit lower in order to keep total portfolio volatility stable. There are times when I think the yield differential between quality bonds and high yield bonds is attractive for investors. This tends to occur at the depths of a financial collapse when investors flee high yield en mass and move to Treasuries. In 2009, the yield differential between Vanguards HYB fund and their Intermediate Treasury Fund was greater than 10%. Just as the equity market started recovering, I switched a modest portion of my bond portfolio from quality bonds to HYB because I thought the reward was worth the risk. The HYB fund did very well over the next year or so at which point I switched back to quality bonds after making a considerable amount of money both from the increased interest payments and from the rapid increase in share price of the HYB fund. The HYB fund with dividends reinvested recovered all its financial collapse losses in about 12 months whereas it took TSM 5 years to do the same. What I'm saying is that sometimes the interest rate spread between HYB and Treasuries offers an attractive risk/reward opportunity for those who are not risk averse. At other times, like during FED induced interest rate suppression when yield hungry investors bought them en mass, the spread did not justify taking on the increased risk IMO. Spreads between HYB and quality bonds have widened recently but not enough IMO to compensate for their increased risk. I hold no corporates and certainly no HYB now as I don't think current spreads are sufficient to justify the increased risk. Yes, that is what one would expect but because the falling interest rate scenario is not likely to repeat anytime soon, I am trying to isolate the capital losses, to be able to determine a fair estimate of what the current yield will actually represent going forward. This relates to separate advice from Grabiner about not reinvesting the TLH back into HYC, due to its tax inefficiency, etc. but that conclusion is based upon the significance of the capital losses the fund is regularly taking. So I would like to see the historical capital losses experienced, in good times and bad, for this fund but have not found it in any of the online literature and so only have anecdotal evidence. Regardless, the common wisdom is that the expected return would be higher by using a safer bond fund and increasing the equity allocation a bit, since the correlation between high-yield corporate and stocks is much higher than that between safer bond funds and stocks. I disagree that this is the "common wisdom." It is espoused by Larry Swedroe, but there is no consensus, and it has been debated on here before. I need to correct an error. The fund started in 1978 but the Admiral shares started in Nov 2001. The starting price of the shares was 6.33, not 10.00, according the price history online. The current price is 5.58. By quick math, that is about an 11% decrease in NAV in 17 years (a quarter of that has been in the last two months of stock volatility). So that would seem to indicate a much lower capital loss ratio that the numbers usually bandied about. Last edited by restingonmylaurels on Fri Nov 30, 2018 11:43 am, edited 1 time in total. I have never understood this argument. Taking huge risks in equity is ok, but taking some risk with bonds is not? Where is that written? I don't understand how people take on the risks of investing in stocks, in some cases in a majority of their portfolio, but when it comes to bonds, they claim they do not want to take any risks at all. Unless you invest 100% of your bonds in Treasuries, then you are taking some risks with bonds. Granted, the risks of investment grade corporate bonds are low, but still it's there. If you invest in any form of bonds other than treasury bonds (corporate bonds, high yield bonds, municipal bonds) then you are taking on credit risks. And even if you stick to treasuries, you are taking on interest rate risk. And although high yield corporate bonds have greater credit risk than investment grade corporate bonds, they have much less risk than stocks. So why is the much greater risk of investing in stocks ok? News flash: if you own the Vanguard Total Bond Market Fund, you are taking risks with your bonds (credit risk, interest rate risk). I agree the risk is small, but it's there. Go to M* and compare "price" (not "growth") of various bond funds over time. I agree with the basics of your post here, there is risk in any investment that provides an attractive return. If you desire lower returns and likely less default risk (compared to equity ownership in the same companies), invest in corporate bonds. For the longer term portion of my portfolio, I do not desire lower long term returns, so I invest in equities. I am taking a chance (potentially with higher risk) because I think I will be rewarded in the long run, but I could be wrong (in the short run). I generally invest in bonds for relatively short durations where the return is of much less importance to me (due to the short compounding time frame) and reducing credit (and interest rate) risks are much more important to me. This is not true. As far back as 1981, NAV was about 8, and as recently as 1998, NAV was about 8. Nav was a little above 6 at one point in 1990 and a little below 6 at one point in 2017. If you look only at annual values, or draw a trend line, it looks kind of like a steady decline, but if you look more closely, you see long periods where the start NAV and end NAV are about the same. So most of the degradation of NAV occurred from 1978 - 1990, and there has been minimal degradation since then, looking only at the start and end values. Looking even more closely, most of the loss in NAV occurred between early 1987 and late 1990, when it dropped from about 9.4 to about 6.1. This does not look like a steady loss in NAV to me. Even if they did publish such a record, losses on bond sold after default, and AFAIK no fund even does that, it wouldn't fully answer the question. A lot of credit losses in non-govt bond funds, especially investment grade, come from selling bonds which have deteriorated in price for credit reasons, but not defaulted. But that's true even of junk funds and presumably particularly among junk funds true of Vanguard's with its active management and emphasis on relative 'quality junk'. Also junk funds have more potential to sell out bonds which have gained in value due to credit reasons, which is less common in IG funds. The price change in a junk bond between purchase and sale could be due to a variety of factors besides outright default: 'riskless' interest rates have fallen/risen with credit spread the same. Credit spreads in general have risen/fallen as distinct from moves in 'riskless' rates. The particular spread of this issuer has risen/fallen due to idiosyncratic factors (outright default is a subset of this category). And also importantly, in a sloped curve, the bond has 'slid down' the curve of 'riskless' rates and/or general or issuer specific spread even without those curves moving. In recent years the latter has been significant tailwind to bond fund 'capital' returns. Say they buy a 5 yr at a yield 100 bps higher than 2 yr yield. That implies a 'risk neutral expectation' of sharply rising rates. But for a long time in the post crisis period that slope manifested almost wholly as a term premium, IOW rates didn't go up as (risk neutrally) 'predicted' by the slope of the curve. Rather, a bond bought at the 5 yr yield could be sold after 3 yrs at a 100 bp lower 2 yr yield when in laymen's terms 'rates didn't change' (or not that much anyway). This could be a significant factor in looking for 'missing' capital losses in junk funds in recent years. It won't be as much from now in today's flatter* curve assuming 'rates don't change'. *a credit curve is typically more positively sloped than the 'riskless' curve because credit spreads are more likely to rise with maturity independent of economic or monetary policy expectations. It's not always true, sometimes very weak credits have higher credit spreads in shorter maturities than longer ones (the market perceived a discrete risk of make or break, default or not, coming soon, the value of which is concentrated over fewer years in a 2 yr than a 5yr issue, so 2 yr spread actually higher), but usually is. Very good explanation. Now, I need to take that forward in to what I am really trying to discover. That is, what is the offset to the yield I should allow for to determine the "true" expected rate of return for this HYC fund? But as previously posts above from Kevin M and myself show, this is not showing up in the NAV over the last 15+ years. So where to find out the most appropriate number to use to determine expected return of this fund? It is truly just the yield, because recent history (15+ years) shows that the various credit events good and bad seem to more or less cancel each other out over longer periods of time? Last edited by restingonmylaurels on Mon Dec 03, 2018 1:44 am, edited 1 time in total. Here's a shorter version: there's no way to isolate the effect of credit losses in particular junk funds from price info the funds publish. That's because a simplifying assumption that the fund's expected return is just composed of SEC yield in interest income minus credit losses from defaults showing up as a price change is not close enough to being correct. The funds realize significant 'capital' income/loss from things other than defaults. Nor do funds publish a further analysis to break down the causes of price changes in a given period. One rough way to estimate expected loss from defaults is just look up the spectrum of ratings of the fund, look up the historical default rates at those ratings (Moody's or S&P, etc sites/papers), and put it in a spreadsheet where you multiply the % historical default rate times the % of the fund at that rating. Then assume some % of recovery in default. 40% is the traditional all purpose guess (ie you lose 60% not 100% of your money in a corporate default), but you can also find rating agency papers with more detail of historical recovery rate by rating and type of debt. That's only a very rough estimate though. It doesn't account for the plus/minus of the managers' selection in dumping v 'riding out' downgraded bonds, nor their selection of particular issues in the first place. And it's backward looking. Expected default rate from now isn't necessarily the historical average up to now. But that rough estimate is still better than a single number quoted by a personal finance guru. Most single numbers quoted are for some junk index so are too pessimistic for the Vang fund which has materially higher avg rating, though of course likewise a lower SEC yield to begin with. It feels too high for there to be annual loss of 2.69% on HYC due to defaults/default sales. Seems hard to understand why they would risk holding bonds at all that have a 1 in 4 chance of defaulting so I would have to think that there is some way they are protecting themselves from default with the B3, C, and NR bonds. This may be getting too complex to ever be able to determine a simple but valid working annual default rate number. 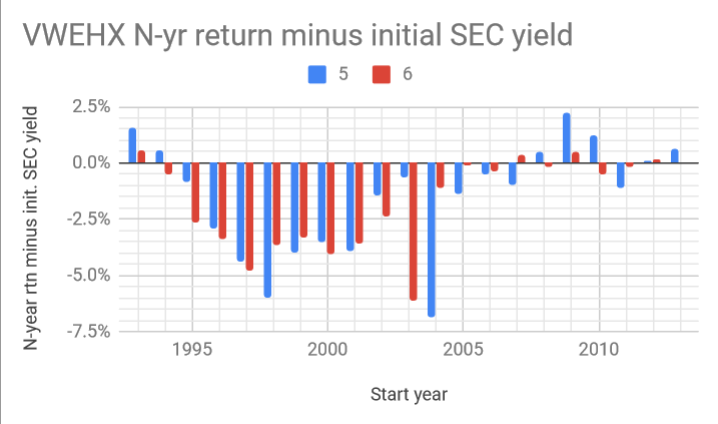 One thing we can do is look at initial SEC yield and subsequent n-year returns. Vanguard publishes SEC yields beginning 1/4/1993, so we can look at this starting in 1993 (I use the 1/4/1993 value as initial yield for 1993, but the last December yield of prior year for subsequent years; e.g., 12/31/1993 yield for 1994). For 5-year rolling periods, average 5-year annualized return minus initial SEC yield is -1.5% with a standard deviation of 2.5 percentage points (pp). For 10-year periods it's -2.2% with SD 1.9 pp. Here are the charts that show this graphically, but I also include 6-year deltas on the 5-year chart and 11-year deltas on the 10-year chart, so we can see how much difference a single year can sometimes make. Look at start year 2004 for the 5/6-year chart, for example. The initial SEC yield was 6.21% and the 5-year return was -0.6%, so the delta is -0.6% - 6.21% = -6.8%. By contrast, the 6-year return was +5.1%, so the delta is 5.1% - 6.2% = -1.1%. These large differences are due to a large negative return of -21.3% in the 5th year (2008), and a large positive return of +39.1% in the 6th year (2009). We can then compare to a higher-quality bond fund, like VBMFX (total bond index). For 5-year rolling periods, average 5-year annualized return minus initial SEC yield is +0.4% with a standard deviation of 0.7 percentage points (pp). For 10-year periods it's -0.2% with SD 0.7 pp. Here are the charts for VBMFX. I could make a number of observations based on the charts, but if you study them carefully, they speak for themselves. I retitled the thread to help with the acronym of "HY" as High yield bonds. it looks like from your analysis that a lot over half of the projected 2.69% loss is from their 7.7% stake in CCCs and lower. Perhaps there CCC bonds average from the high end of those rating bands and thus have lower default rates? It looks like there current CCC stake skews to the high end. Also there is some evidence that CCC exposure can be tactically timed. They may be doing some of that. Kevin, this seems a really good way of perhaps teasing out the default losses/sales. Although I imagine there are other factors at play besides credit issues, such as interest rate ups or downs, that impact the delta between SEC yield and return, it is likely in this type of fund that credit issued predominate. If that is true, then let me take a brief shot at the lessons learned here. Please correct / add as appropriate. The 5-year rolling return is perhaps the more accurate measure, as it is close to the fund's (current) duration of 4.4 years. The 1.5% delta between SEC yield and total return over 20 5-year rolling periods matches what Rick Ferri had previously stated here as his best estimate of annual capital loss to credit issues. This number is an average over a long period of time inclusive of at least two major credit crises (2000-1, 2008-9), so appropriate to use for long-term investing in this fund. For periods outside of major credit crises, the delta is likely to be significantly different and so the fund's return closer to the SEC yield. And the most important issue is that the fund loses its diversification value because of those credit crises. In 2008, adding an investment-grade bond fund reduced the decline of a portfolio with stocks; adding a high-yield fund gave much less benefit. If you can tolerate a 30% loss, you could hold 60% stock and 40% investment-grade bonds, or 20% stock and 80% high-yield bonds which lose half as much as stocks in a crash. The 80% HY portfolio would have done much better in the 2000-2002 bear market though. 2008 was sort of an anomoly. The spreads were pricing in something like 15% default rates . Thats not really normal recession behavior. Now of course things could be even worse than 2008 in the future and I would not want to hold a 80% stake in high yield but 10-20% seems fine. I don't know if 2008 was an "anomaly" or 2000-03 was the anomaly. 1990 was of course worse (the Drexel Burnham bankruptcy and the arrest of Michael Milliken). What is true is credit quality has been steadily declining - Hyman Minsky more or less predicted this in his theory of financial crises and recessions. That's for all types of corporate borrowing not only HY. You are being sensible about this - you are taking a view that credit risk is a separate factor, and it can be separated from equity risk - thus gaining exposure to it is worth having. Anti Illmanen is probably the most reasoned academic-practitioner bridge and I don't have his book to hand. The other view is that credit risk and equity risk are too highly correlated to make much odds. As we had been discussing in another thread, viewtopic.php?f=10&t=264210, I am trying to find a successor fund to long-held HYC shares that I am TLHing. As I am currently in the wash sale period, I am still mulling the proper successor fund. You had suggested LTTE or ITTE for those in the 22% or higher marginal bracket or ITIG for those in lower marginal brackets. This is good advice that I evaluated against moving the funds back into HYC after the wash sale period ends. Although you do not recommend it generally, I am OK with taking some risk in bonds (why else would I be in HY to start with?) so I am considering the HYTE as well. Here is how those four funds lay out side by side. The tax rate is 23%, a merged 22/24% rate. I estimated the credit losses on the TE funds, extrapolating from corp credit losses of similar ratings (could be off somewhat). Even after the credit loss allocation, to me the choice still is HYC, based on after-tax total return and considering also that it has the additional benefit of a shorter duration in a rising rate environment. Can you tell me, now that I have considered and quantified the two disadvantages of HYC that you have pointed out (tax and credit losses), what else tells you that one of these other funds is a better choice going forward? One of the implications of what you have shown in your posts on this thread (that the losses are not showing up in a lower NAV but are reducing total return vis a vis SEC yield) potentially solve one of the problems with holding this fund. That is, the asymmetry of taxation that when the income is taxed at ordinary marginal rates but if the credit losses are hitting the NAV, then they would only be recovered through reductions in capital gains at the capital gains rates and only when the fund shares are sold. If the credit losses are flowing through instead as reduced distributions, then this solves the taxation problem, as these would reduce the tax paid on ordinary income instead of capital gains and would also solve the timing problem, as the reduction would happen in the year of the losses instead of building up over time in the NAV. Whether intended or it, would you say this is what is in reality happening? I don't think this is what is happening, because interest rates were declining over this period. Lower interest rates cause bond funds to have capital gains; these gains go away if a bond is held to maturity, but are realized if the bond is sold before maturity. Defaults and downgrades cause bond funds to have capital losses. Vanguard's high-yield fund sells most bonds before maturity, so it gets capital gains from falling rates, and capital losses from downgraded bonds. It still gets almost all of the coupons as payments, as it usually sells bonds before they default. So in essence you are saying the situation has been something like the following (my weak attempt at fund accounting, using hypothetical numbers). I wish I could find that source of historical VG SEC yields that Kevin referred to. In lieu of that, I find the S&P 500® High Yield Corporate Bond Index had a YTM of 4.96% 5 years ago and a now has a YTM of 5.56%. Does that support the notion that interest rates have been falling sufficient to offset the credit losses?